Robin Thede is a fearless comedian, actor, and writer, a true trailblazer. She is the first African-American to serve as head writer for the 2016 White House Correspondents’ dinner, as well as being the head writer and regular performer on The Nightly Show with Larry Wilmore. 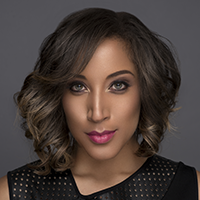 Now Thede is the only woman of color currently hosting a late night talk show, The Rundown with Robin Thede, featuring biting, satiric commentary on our crazy political and pop culture worlds. Thede and her team of producers and writers will discuss how they create their own unique, in-your-face take on today’s headlines. An episode from her acclaimed series will be screened and questions will be welcomed form the audience.